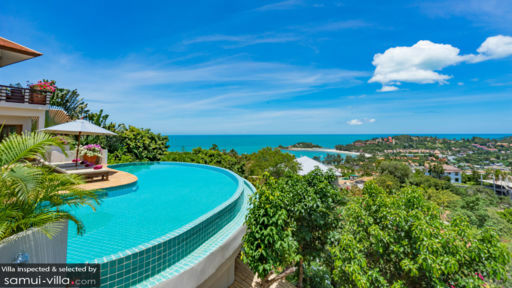 Located over Samui’s famous Choeng Mon beach, Bian Arun is a fabulous tropical holiday home close to Samui’s major attractions. 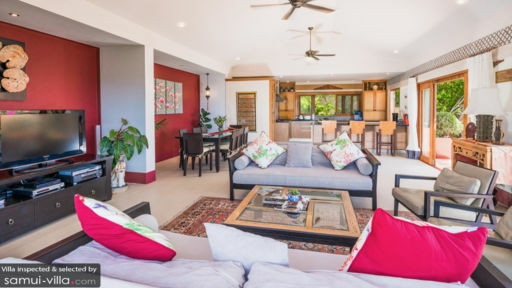 With four bedrooms, the villa is ideal for large families or groups traveling together. Divided into two separate areas, one comprising the main living/ dining and the other with the master bedroom, the villa offers a sanctuary with its infinity pool ready for use by guests. As you laze in the comforts of this home away from home, you are sure to leave well-rested and rejuvenated! With four bedrooms the villa can accommodate quite a few people and for added privacy, the rooms are divided between the two areas at the villa. The main living area has two bedrooms on the lower floor which are furnished with king-sized bed and en-suite bathrooms fitted with walk-in showers. You can exit the rooms to reach the pool directly through sliding doors. The second section of the villa comprises the master bedroom and the downstairs fourth bedroom. The master bedroom features an outdoor shower and an en-suite bathroom. It is furnished with a king-sized bed and offers sprawling views of the bay. The fourth bedroom is similarly designed with direct access to the pool. It is furnished with twin-beds and has an en-suite bathroom. Sprawling in front of the villa is lush, green tropical vegetation that can be observed for miles ahead. 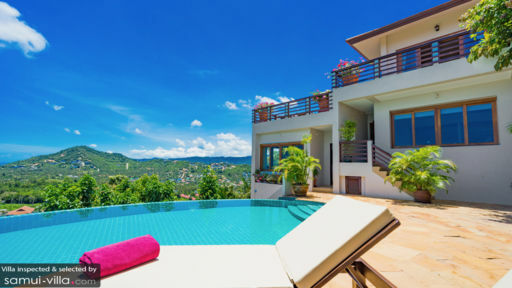 Just off the foliage is the beach with its sandy shores and clear, blue waters and the hills in the distance, all together they make a postcard-worthy panorama that you can enjoy to your heart’s content from the infinity swimming pool. Lounge on the sun chairs found on the pool deck relishing the breathtaking beauty of the island and sunbathing under the tropical sun. The terrace is furnished with an alfresco dining table and loungers so you can enjoy a nice nap and a feast in the open air. Of the two areas at Baan Arun, one is the main area which consists of the living area and dining area with a massive kitchen. The living area features glass windows that offer a gorgeous view of the panoramic scenery. The room is furnished with comfortable sofas and chairs where you can relax and watch television on the flat-screen TV. With shades of red, the walls compliment the carpets and upholstery as well as the natural beauty outdoors. There is antique furniture and cabinets in the living area to create a nice amalgamation of the old and new. The dining area is found beside the sitting area with an eight-seater dining area which is perfect for enjoying hearty meals prepare especially for you. You can even use the state-of-the-art kitchen which is fully-equipped with all amenities and facilities. The modern kitchen features an island countertop with barstools for drinks and quick bites! For the upkeep and management of the villa, there are two resident staff who are there to look after the cleaning and housekeeping. If you require transport to and from the city center, the staff is there to assist you. You can hire cars and rent bikes so you can move around with ease. Baan Arun has an ideal location close to Choeng Mon beach which is the most happening beach in Samui with Choeng Mon night market and other things to see and explore. There are many restaurants, bars, and cafes for you to check out and unwind during the evening!